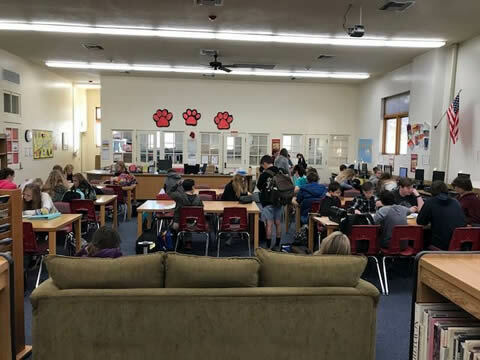 Welcome to the Prescott Mile High Middle School Library! Library hours are 7:30 a.m. till 3:30 p.m.
PMHMS has a collection of over 10,000 volumes and is part of the Yavapai Library Network, which gives our students access to over forty libraries in Yavapai County. All students are part of the Yavapai Library Network, but they are not able to use their PMHMS library account number at the other network libraries; they will need to sign up for a community library card at the public library. Students may check out up to 3 books at a time, for a period of 2 weeks, and may renew their books twice. Students must renew their books in person. A 10 cent fine per day is assessed for every day a student’s book is overdue, with a 3-day grace period. As stated in the student handbook and in the notice signed by the student parent/guardian, “If a book is damaged or lost, it is the responsibility of the parent/guardian to reimburse the school for the replacement cost of the book.” If a student damages a book, a damage fee will be charged to his/her account. If a student loses a book, the replacement cost will be charged to the account. Reading is the foundation of our kids’ educational experience. If your child’s middle school reading skills aren’t at or above their grade level, they are going to face an uphill struggle that will get progressively worse. There are some things you can do with your child that will help them keep reading and improve their reading skills. Make sure your child has a public library card and/ or visit the library together. A public library has access to many books, including audio books for listening and e-books that your child can download. Try to make it an event where you share some one-on-one time and both choose a few books. Get them a gift certificate to a book store. These are great gifts for birthdays and holidays. Listen to books on CD in the car. Listening to a novel that will appeal to everyone makes vacation car trips or even back and forth to school more fun. Play games that utilize reading. Word and vocabulary-building games like Scrabble or crossword puzzles are great. Encourage them to read to a younger child. Let them take over ritual bedtime reading when possible.